Want to buy a Chinese tea pot and set? Tea was first cultivated in China, so no tea connoisseur should be without them. There are two types of Chinese teaware every drinker should know about: the Gaiwan and the Yixing tea pot. The two types of brewing vessel also symbolized two broad types of brewing style available: brewing in a cup or brewing in a pot. A gaiwan is basically a bowl with a lid. It is normally used for steeping lightly oxidized teas such as white tea, green tea and lightly oxidized oolongs such as the Tieguanyin. 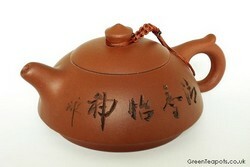 A Yixing tea pot is made of clay. It is normally used for brewing highly oxidized teas such as the dark oolongs, the Chinese red tea and old pu-erhs. The word "gaiwan" can be translated into English as "covered bowl', or a bowl with a lid. It really is an elegant device that allows you to brew many types of tea easily. A typical gaiwan consists of three parts, and from bottom to top: a saucer, an open bowl and a lid. The saucer is there to catch any drips. You use the lid to steep the tea. This lid also serves as a strainer. You can either pour the tea into another cup for drinking (which is what I normally do) or drink straight from the bowl itself. The most versatile Gaiwan is made from porcelain or glass. But they can be made from jade, or even Yixing clay. If you are brewing a lightly oxidized oolong tea such as the Taiwanese Baozhong or the Chinese Anxi Tieguanyin tea (Iron Goddess), I would recommend a porcelain gaiwan. If you are brewing white and green tea, a glass gaiwan would be nice as it lets you admire the beautiful leaves. Unlike a Yixing tea pot, the inside of a gaiwan is always glazed, so it doesn’t absorb flavors. That means you can have one gaiwan and use it to brew more than one type of tea. When brewing the less delicate teas, you may want to consider preheating the gaiwan with a little bit of hot water before brewing, otherwise your tea might cool too quickly. When buying a gaiwan, look to make sure that the lid fits snugly. A wide rim makes it easier to pick the gaiwan up and pour it without touching the hot part of the cup. A popular item on Amazon is this Sado Traditional Gaiwan Teacup (150ml/cyanic Colours Lotus Leaf) . If you click on the link, you will find several products on the same page, which you can select. Also look at this Moyishi Chinese Glass Gaiwan . Can you see how the generous lip will make it easy to grasp? Plus, you can actually watch the tea as it brews. If you are buying glazed Chinese tea ware, it is a good idea to check that the glaze is lead-free, especially if you are buying handmade pottery directly from China. Lead can sometimes leach out of glazed ceramic dishes, especially if the temperature the clay was fired at is different from the glaze manufacturer's temperature specifications. This could be a concern for commercial pottery with poor quality control, but is more likely to be a concern with handmade pottery simply because the artisan does not have as much control over the conditions inside the kiln. What is a Yixing Chinese tea pot, anyway? This type of Chinese tea pot has been used for brewing tea since the Song Dynasty, which ruled from 960 to 1279 A.D. During the Ming Dynasty (1600’s), they were the most-sought out tea vessels around. Yixing is considered the pottery capital of China, and it is the only region in China where you’ll find the unique “purple clay” used to make Yixing tea pots. This purple clay is the perfect material for making tea pots for a variety of reasons: it is strong and hard to break, it is a beautiful color, it retains heat well and it is porous. The beauty of the clay being porous is that it absorbs the flavor of the tea that is brewed inside. While most of your teaware may age and lose its luster over time, the Yixing tea pot actually becomes seasoned and matured over time. In China, people called it "Yang Hu", or pot cultivation. People collect Yixing tea pots not only because they are attractive, but also because they "remember" the tea you drink, improving the tea quality over time. It has even been said that a properly seasoned Yixing Chinese tea pot that has been in use for a long time can brew tea with nothing but water! Now, try to beat that! Yixing tea pots are also works of art. They are individually handcrafted by Chinese artisans, and the work of the best Yixing potters is valued by collectors as much as a fine sculpture would be. Yixing tea pots come in a variety of shapes, ranging from the plain to the fanciful. When purchasing, look to make sure the tea pot is well-crafted, and that the lid fits snugly on top. If you are collecting Yixing, you’ll want to be pay attention to the artist, too. Six things to consider when buying a chinese tea set containing Yixing teapot and cups.